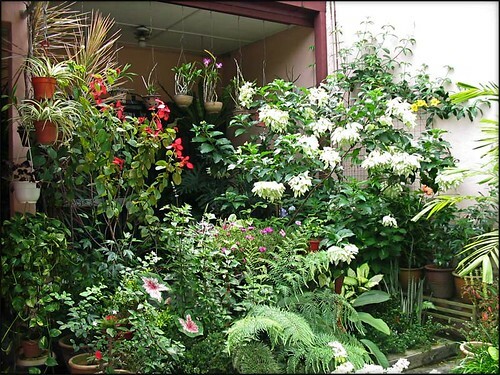 Everything seem so marvelously perfect in our tropical garden setting in June. Foliage plants were at their luxuriant best, flowering plants/shrubs were happily blooming non-stop, mealy bugs/white flies were least seen, and even the weather was extra kind, neither too hot nor too wet. To give you an idea, we’ve added our garden image here, displaying a section of our front yard, just outside our home and adjacent to our car porch. Such wonderful beauties that put smiles on our faces unceasingly. Just give them a little TLC and be rewarded with a multitude of colorful goodies! Frankly, we are very happy and delighted with our little paradise, contented with the many blessings therein. Yet, our loving and gracious God wants to give us more…! A rare and remarkable event unfolded in our lovely garden in June. 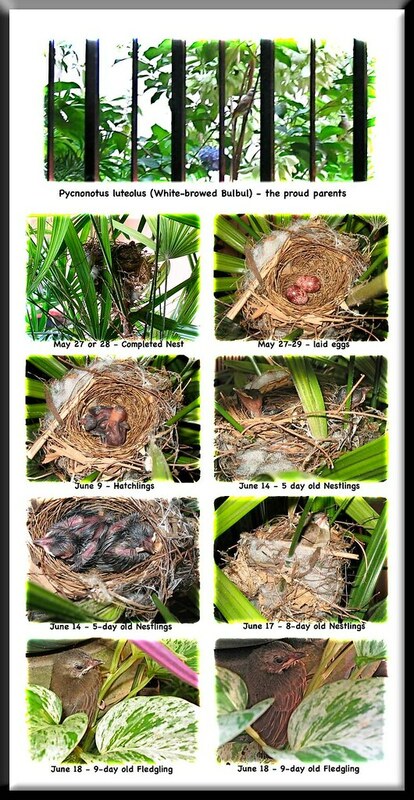 We got to witness the amazing breeding cycle of the Pycnonotus luteolus goiavier (White-browed Yellow-vented Bulbul), the whole process, from nest-building to fledging their young birdies! How awesome – one of our most joyous and blessed lifetime experiences! More here. To further recapture the memorable one-in-a-thousand chance experience, I just have to create a life poster of the birds’ breeding event and, to thank God for this awesome gift with the amazing hymn, Shout to The Lord. February 2011 in our garden: wonderful happenings!